Mountain Town Magazine, Winter 2013/2014. Page 86. 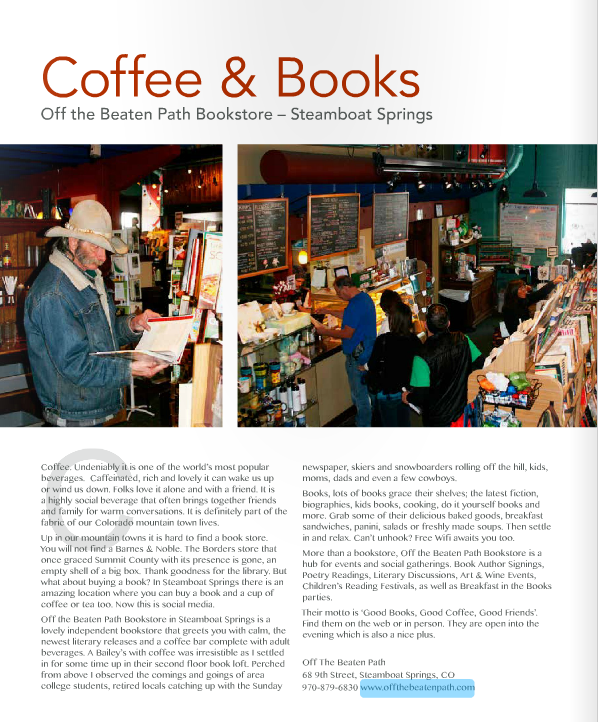 "Off the Beaten Path Bookstore in Steamboat Springs is a lovely independent bookstore that greets you with calm, the newest literary releases and a coffee bar complete with adult beverages. A Bailey’s with coffee was irresistible as I settled in for some time up in their second floor book loft. Perched from above I observed the comings and goings of area college students, retired locals catching up with the Sunday newspaper, skiers and snowboarders rolling off the hill, kids, moms, dads and even a few cowboys. Books, lots of books grace their shelves; the latest fiction, biographies, kids books, cooking, do it yourself books and more. Grab some of their delicious baked goods, breakfast sandwiches, panini, salads or freshly made soups. Then settle in and relax. Can’t unhook? Free Wifi awaits you too. More than a bookstore, Off the Beaten Path Bookstore is a hub for events and social gatherings. Book Author Signings, Poetry Readings, Literary Discussions, Art & Wine Events, Children’s Reading Festivals, as well as Breakfast in the Books parties..."
"An Epic Book Nook" from "5 Reasons To Visit Steamboat Springs"
It often seems as if all Steamboat paths lead to Off the Beaten Path (68 Ninth St., 970-879-6830, steamboatbooks.com), the bookstore/coffee shop just off Lincoln Avenue. You forgot reading material? You need to satisfy your twice-daily caffeine fix? You're in search of friendly conversation with a stranger? 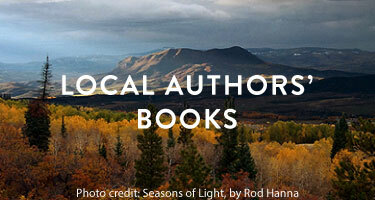 Steamboat is a friendly place, but this bookstore can fill those needs and more. "A throwback to the Beat Generation"
Off the Beaten Path is a throwback to the Beat Generation, with poetry readings, lectures, and concerts. It has an excellent selection of New Age works, in addition to the usual best sellers and travel guides. If my hands weren’t busy juggling my recent purchases, I would have clapped my hands like a five-year-old girl getting her first American Girl doll. This little gem is an independent store that has been in business since 1990 that is open seven days a week AND open 8 am-7 pm every night. Their web site says they are open later during peak seasons. Shut up. You had me at open. I would spend all of my writing time in this place if I lived there. The store isn’t huge but from what I could tell, they are good at what they do. As night falls, you'll be lured to the inviting glow emanating from Off the Beaten Path, an eclectic bookstore/coffeehouse/wine bar in a Victorian-style house. Here's a small collection of some notes we have received from our customers. You can also hop over to TripAdvisor and Yelp to read more reviews (and you'll see that we're not faking all the love letters)! "We come here every year from Ohio - and you are our favorite bookstore!" Anonymous, Ohio.